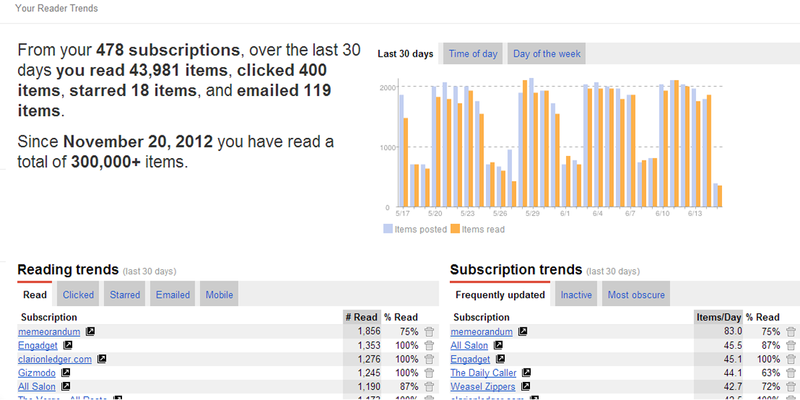 As everyone knows, Google Reader will soon be no more. I’ve tried many replacements but have found none which don’t require annoying compromises. I don’t want just a mobile app. I don’t want a special plugin. I want to be able to move through all my feeds on the keyboard, instead of just the items within a feed. I’d like updates in some reasonable timeframe. What I want is to keep Google Reader. It’s my most frequently visited website. I log in first thing each day while on the bus. I monitor in the office while waiting for searches to run. I check for final updates before going to bed. Google Reader keeps me plugged into Google’s other products – since I’m already there, I’m more tempted to use Docs or Gmail or Youtube over other alternatives. But, in addition to the loss of Reader, I’m noticing that the once-acceptable Google Ads are getting annoying. Visit a Youtube video and you’re forced to watch a long ad. I clicked a link in an article to a musician’s performance the other night and was presented not with that song, but a full length version of someone else’s music. Perhaps that would have been clever, in a sort of Pandora style, if it had been in any way related to the music I wanted to hear, but it wasn’t. I fear Google is losing its way. I have a proposal, Google. Please let me give you money to support your services. Calculate how much you make from showing me ads that I ignore and the cost of the burden I place on your infrastructure. Set the price at that, plus some more. I will happily give you a non-trivial amount of money each year for Reader, Gmail and an ad-free internet experience. Perhaps throw in some additional storage space if you like, or have my Reader items take up space in my existing allotment to entice me to buy more. Heck, offer a premium tier over that for people who might want support and assistance. I suspect a number of business users might be willing to shell out the cash. With Wallet, Google has already resolved how to collect money from users. One of the largest drivers for websites needing to base their income stream on advertising is the complexity of collecting money from users. That problem is solved. Google has even shown its ability to do that at scale by moving to paid services for Google Apps users. There is a place for free services and I’m glad that Google provides them. The internet is growing up, though. It’s not evil to ask users to pay for what they use. Quite the contrary; users will appreciate the option of supporting the services they use.